This post, like many others it seems at the moment, has been horrendously delayed. 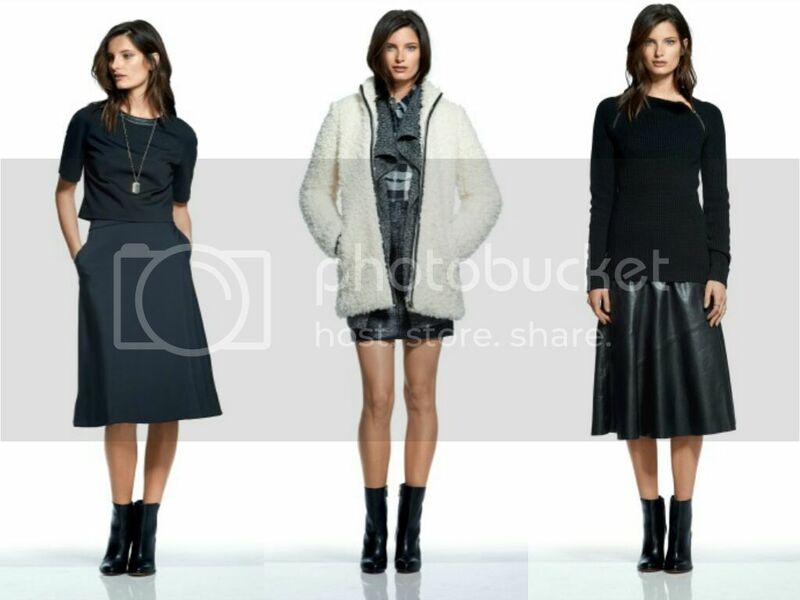 A few weeks ago, I was invited down to Banana Republic's store at Manchester's Trafford Centre for an introduction to the brand and their Autumn/Winter (or Fall/Winter as they might say across the pond) 2014 collections. The Trafford Centre store is actually only one of two in the UK which are based outside of London. Even though the store's position in the Trafford Centre is really prominent, on the upper floor more or less opposite Selfridges, I'd often walked past but never been in. The brand was founded in 1978 and was bought out by Gap a few years later. Perhaps a little guilty of standing in Gap's shadow, Banana Republic has been continually growing and expanding its reach across not only America, but Europe too. Recent developments have seen the brand gaining attention and kudos in its own right such as the recent appointment of former J.Crew designer, Marissa Webb as Creative Director back in April. The Autumn/Winter collection is the first to have seen her influence. The result is an edgier, more fashion-led look for the brand and I'm excited to see what the future holds for SS15 which will have much more of her design input. Back to the present, I was really surprised by what I found in-store. The clothes are exactly the sort of thing I'd wear for work; minimal, clean silhouettes in neutral shades and a range of textures like silk and faux leather. There's lots of clever, flattering design details across the collections and the introduction of the new petites range was particularly good to see. I'm not necessarily petite myself but it was great to be talked through the garments which have been carefully chosen for inclusion in the line. My mum is petite and I know that choice can be limited if you don't want to tolerate clothes which are too long in the arm and leg. I was invited to choose a few pieces from the store and as well as falling in love with the 100% Silk Popover Blouse so much that I bought it in two colours, I chose a beautiful black midi skirt. I was waited for the right occasion to wear it, with its first outing being for my 25th birthday meal. It's made from a really lovely thick fabric and is perfect for Autumn. I also love the pockets at the sides. 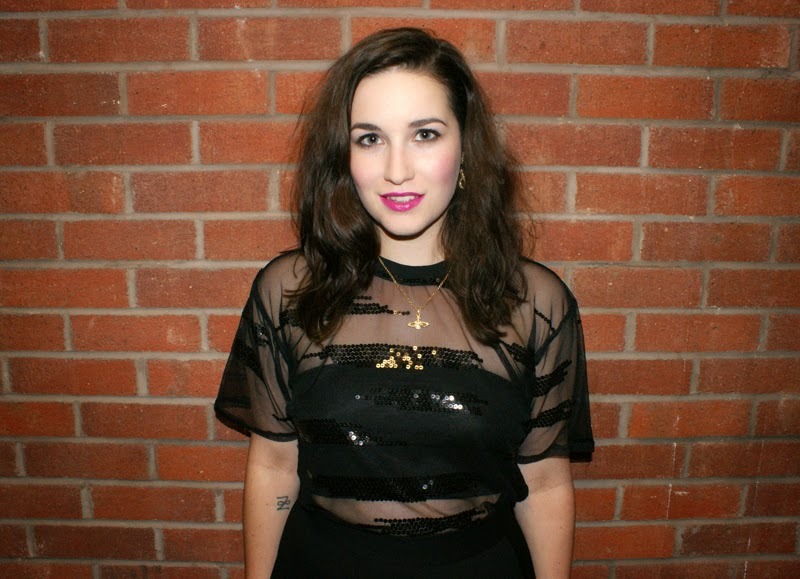 I teamed my skirt with this cool sequin and mesh tee from Ragged Priest. They had an online sample sale recently and I got a massive haul. A disadvantage of living up north is missing out on all the great brand sample sales in London so I was so happy to see them doing one online. I'm also wearing my new Vivienne Westwood gold orb necklace which I LOVE- a birthday present from the boy, he did good! Have you taken a second look at any established brands recently? I really need to check out Banana Republic again, I've only ever shopped there in the States, had no idea we had one in Manchester!